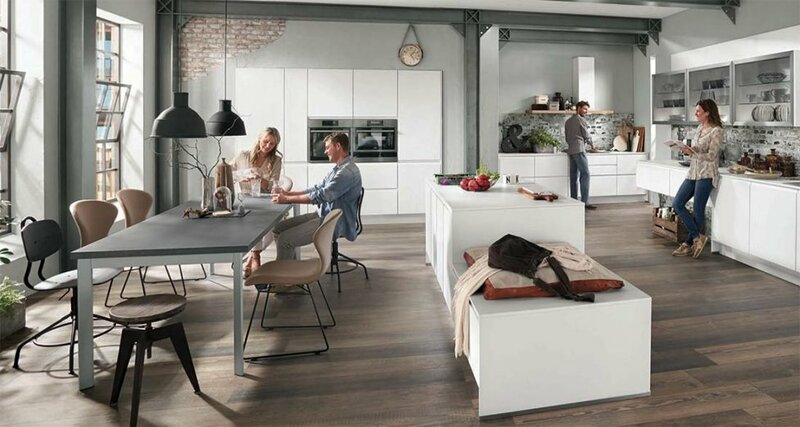 Nobilia Kitchens Inline 551 is a luxurious Lacquered door front in Honed Alpine White to create a stunning handle-less German Kitchen that is new to Nobilia from 2017 onwards. Clean lines, exquisite materials and clearly structured architecture – this is what distinguishes our designer kitchens. The smooth, uncomplicated finishes make quite the impression, even in open-concept kitchens for a straightforward life- style with a modern flair. 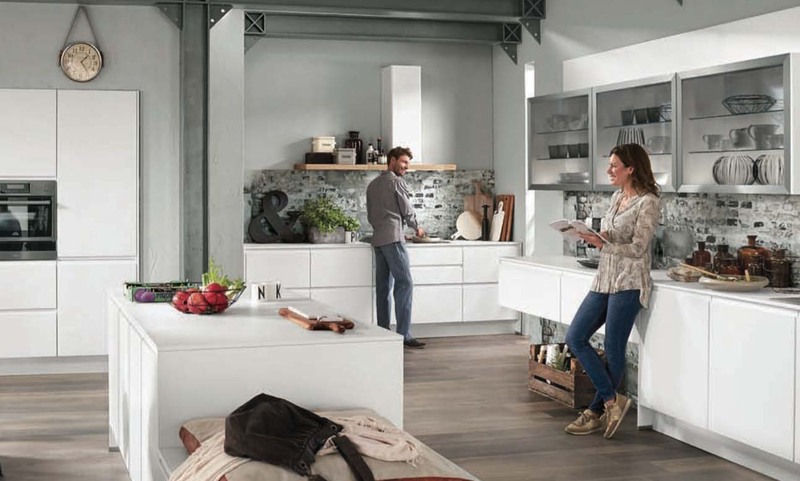 Connoisseurs of puristic design are well-served with our handleless LINE N kitchens. Here, the integrated recessed handles take the lead as the horizontal stylistic element that sets the tone for the new kitchen. Below (1) – The possibilities for designing attractive recesses are virtually endless. Décor Factory grey in the kitchen imparts a certain urban flair. 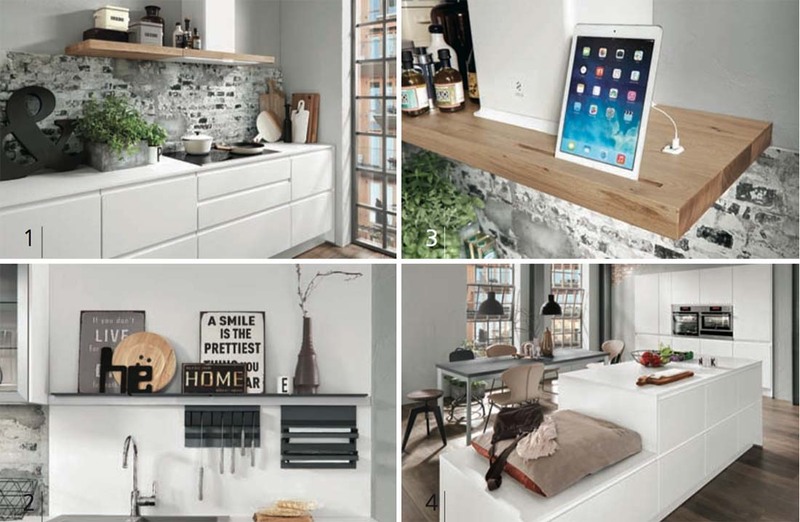 Below (3) – The railing system Linero MosaiQ impresses with its multifaceted storage options. Above (2) – The wall-mounted cooker hood Elica Bio has an integrated USB charger on the solid oak storage shelf. Above (4) – A free-standing island gives a clear structure to spacious rooms and also visually separates the cooking and dining areas. The island is designed with pull-out units on both sides and provides much storage space for kitchen utensils. Industrial style interiors have an appeal all of their own, that certain, indefinable something special. The design, with its rough brick, combination of matt lacquer fronts and Slate grey table top with a concrete appearance, real wood floor perfectly embodies an urban vibe. And you don’t even need to move into a warehouse to experience industrial chic! Nobilia’s niche claddings with digitally printed motifs lend an industrial touch to even small rooms. 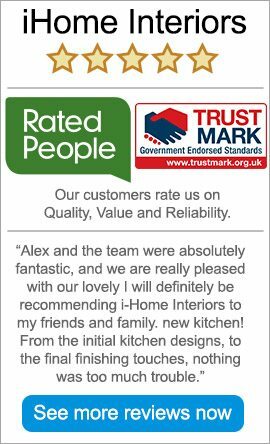 If you are interested in INLINE by Nobilia for your new German kitchen, or any other of the kitchens we design, supply and install, we operate across Buckinghamshire, London, Berkshire, Surrey, Oxfordshire, Hampshire and Hertfordshire and offer a FREE HOME DESIGN SERVICE.